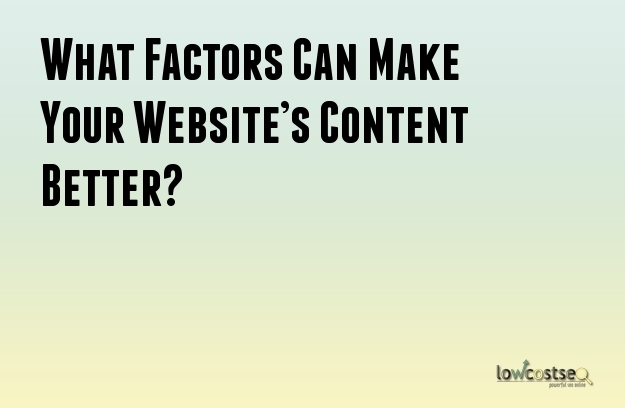 What Factors Can Make Your Website’s Content Better? Better content is… well, better. This is an age old truth that every SEO agency and expert understands. But what exactly does “better” mean? When you have important content, such as landing pages and other key areas, you should always seek to improve them. This is where the likes of A/B testing can prove useful, of course, but it’s also important to test new ideas now and then. Stagnant pages will only lose to competition that continues to be creative. So, what areas can you look at? Good testing shouldn’t change the entire page at once – unless it is really underperforming. Instead, you should look at changing smaller things on a regular basis, monitoring the results. This will help identify what does and doesn’t work much more efficiently. The H1 text is often the first thing people see, so obviously it’s a key area for making a good first impression. Keywords are a strong way to create a connection with search traffic, but what about ensuring you don’t suffer a low conversion rate (or high bounce rate) because you used terms that don’t directly correlate with your SEO goals. In one study, Movexa was able to increase conversions by 89.97%! How? By changing the heading on its landing page. That’s all. It changed from “Natural Joint Relief” to “Natural Joint Relief Supplement”. Obviously, the addition of “supplement” helped with targeting search queries, as it’s a very broad keyword. Yet it’s also a very straight-to-the-point term as well. Users know what a supplement is, where as “joint relief” still left some doubt as to what the actual product was. The more down to earth answer gave users the information they needed without having to read (or even click through) to the page. Part of this may also relate to how users browse webpages. Studies have shown that people look at web pages in an F shaped pattern. The highest concentration is along the top, the left side and some content in the middle. The header, clearly, forms a vital part of this F. Testing for better impact here will ensure users eyes make it to the rest of the page or website. If you’re trying to sell a product or service, you need to get straight to the point. In many cases, such as e-commerce, a picture really is worth a thousand words. Want to show how great your clothes are? Use well lit, clear photographs. Remember the F-pattern of browsing mentioned earlier? This means more people pay attention to the top of the page, so you only have a limited amount of space to work with before readers start to lose attention. This is the same approach that works with meta descriptions and PPC. When you only have limited space, you need to get to the point. Focus on your USPs and state the facts that grab a reader’s attention. Even the slightest change can make a difference. Online store Fab was able to improve conversions by 49% simply by changing “add to cart” to “add to bag”. Since this isn’t messing with your keywords, you should be free to experiment and find what resonates with your audience. Finally, as you’ve probably heard a million times already, great content really does count for a lot. Link building is vital for increasing online visibility, and a key part of this is having something people want to share. Having people actively share your work makes link building much more powerful. Case in point: by adopting a new strategy, with blog content as a primary focus, square2marketing was able to increase traffic by 2,200% in one year. That’s certainly a positive result. This is why so many websites need to support themselves with addition content, whether its guides, articles, infographics or a regular blog. Understand your audience and create new content that it actively wants, rather than just trying to catch additional keywords. From a conversion point of view, there is plenty of content ideas that will keep people on the page as well. Kiva, a non-profit organisation, increased its donations by over 10% just by adding some of this content, such as an FAQ page and some statistics. This isn’t keyword-loaded or SEO prioritised, but it acted as “social proof”, providing credibility and authority. So, the next time you’re thinking about how your content could be better, don’t just think about adding new keywords or trying to push new links. Sometimes even the smallest of changes can cause some big after-effects. The only way to find out is to test, record and evaluate the results!